Making true to her commitment of improving the lot of local school board teachers, Surigao del Norte Governor Sol Forcadilla-Matugas recently ordered a second-round increase on mentors’ honorarium which would benefit one hundred seventy two elementary and secondary volunteer-educators province-wide. In an exclusive interview, Matugas said that school board teachers will receive a monthly honorarium of P7,000.00 effective June this year – or an increase of P1,000.00 from its current pay of P6,000.00 per month. “The pay increase which takes effect beginning this school year, though minimal, can help alleviate the plight of our local teachers vis-à-vis our present economic condition,” Matugas said. 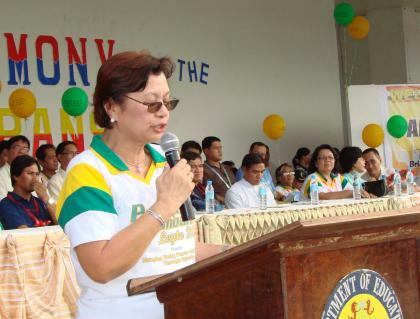 A retired DepEd regional director prior to her election as provincial governor in 2010, Matugas earned the appreciation of the education community when, shortly after she assumed office, she ordered an increase in the honorarium of local school board teachers which doubled up their monthly take from P3,000.00 to P6,000.00 and provided for an annual ‘chalk allowance’ of P1,000.00. Banking on her previous credential as one of the noted educators in the country, Matugas made waves in the local scene with an education program which saw a dramatic increase in the number of school board teachers from only 88 in 2010 to 172 at the present, budget increase in the local school board fund from P4-million to P8.6-million, intensification of professional trainings for school administrators and public school teachers, integration of ‘day care centers’ into mainstream elementary schools, establishment of secondary schools in far-flung areas, establishment of school libraries in Siargao and Surigao del Norte DepEd Divisions, and college scholarships for deserving poor students, among others. She also lobbied before the Secretary of Education for the allocation of additional teacher-positions or ‘teaching items’ in the province. A former victim of political persecution, Matugas was unceremoniously transferred to Region 8 where she retired as DepEd regional director in 2009. She was a reluctant candidate prior to and during the May 2010 elections and a virtual underdog who was then facing an undefeated opponent with a formidable machinery who was described by political pundits as unbeatable. But she overcame the odds and handily trounced former governor Robert “Ace” Barbers, the last man standing of the then Barbers political dynasty. Last month, the Second Division of the Commission On Election upheld the victory of Matugas after it junked Barbers’ election protest for lack of merit.